The compact C-Class sedan is the smallest and most inexpensive Mercedes sedan sold in the United States. Numerous models are offered with alphanumeric names that are tied to the powertrain. The C250 equips a 1.8l four-cylinder turbocharged engine. The C300 equips a smaller 3.0l V6 engine and the C350 upgrades to 3.5l V6. The high-performance AMG variant is the C63 AMG which has a 451-bhp, 6.2l V8 under the hood. All C-Class sedans have an automated seven-speed transmission. The C300 model is offered exclusively with 4MATIC all-wheel-drive. The other models are rear-wheel-drive only. The C-Class carries a high level of standard equipment, but like other Mercedes models, the base price does not include leather upholstery. 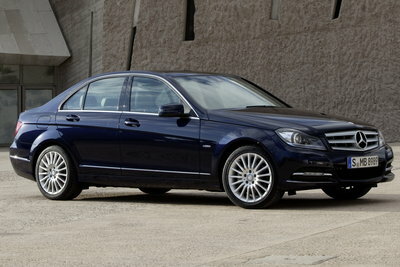 The C-Class includes an updated telematics system for 2013. Power increases by 20 horsepower on the 3.0l V6 powered C300 models. Start/Stop functionality is added to C300 and C350 models.